"I wanted to give this class because I wanted to paint like Pollock with a group of people who want to paint like Pollock." This is how artist Kay Gering introduced her workshop students at a multi-generational cooperative camp in Ottsville, PA (ECRS) to the drip and splash technique of abstract expressionistic Jackson Pollock. Pollock pioneered the form in the 1940s and early 1950s. He was much more interested in the physical act of making art than the results on canvas, Gering explained. With dozens of colorful, acrylic house-paints donated by her contacts, Gering set her group out with cups, straws and sticks to create Pollock-like art on oversize white and black canvases and to over paint some smaller art reproductions. Your correspondent interviewed one participant, T, as she moved about the canvases, paint cup in hand. For her, the class had special significance. T recently attended the critically acclaimed stage production of the French produced "Pollock" in which her daughter starred as Pollock's ambitious artist wife, Lee Krasner. Watch campers, young and old, splash paint on large canvases in imitation of abstract expressionist artist Jackson Pollock. 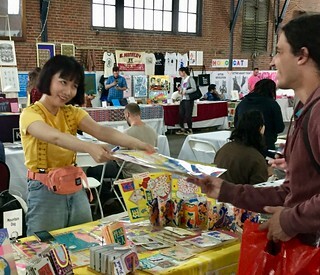 "Presented by Philadelphia Photo Arts Center the Philadelphia Art Book Fair is a two-day event, which showcases a wide range of exhibitors, from large and small photography and art book publishers to individual artists and institutions, local, national and international." Paul Shortt's book of 10 different license plate-size "Signs for Galleries" pokes fun at how art galleries go about their business, signs that gallery owners wouldn't dare post but capture what they say or the subtext of what they say or what they wouldn't dare say to aspiring artists. "Currently hiring only interns,""Showing Friends' Work Exclusively," "Mid-career Artists Only," "Can You Do It For FREE" and more. Watch Shortt poking fun at galleries with his signs here. He has also created a practical book of license plate sized signs for artists to use in a variety of situations expressing what they should be saying as advocates for themselves but might not have the gumption to say. “Pay me for my art” or “Is there an honorarium?” to hold up those who would ask a working artist to work for free. “Show up” to hold up to friends who say they’re going to attend your show but have no-showed in the past. “Rejection letter needed” to show curators who don’t send a rejection letter after the show opens and you realize you didn’t get your work in. Some of the signs are just good reminders “Trust Yourself” Watch Shortt showing his tongue-in-cheek signs for artists. Yusha Chen's sexually charged, scatological accordion-style comic book is about “the laziest person in the world” - herself There she is a tiny figure in bed engulfed by a massive cover not wanting to get up. Then she’s just sitting on a bare mattress, arms and legs defiantly crossed. She eventually does go out to squat and poop, depicting herself doing her business on a small square of grass surrounded by flowers. But later in the spring she wants to start to move again and shows herself jumping in a swimming pool - before heaving up a virtual stream of water through her mouth. It’s all what’s in her head, her dreams, she says. She worked on the book during here last semester of art college. Watch video interview of Chen describing her self-mocking sexually charged comic book."